China: Japan-Manchoukuo Protocol signed at Sinking aka Hsinking (currently Changchun, China), thus creating Manchukuo, a Japanese puppet state in Manchuria and eastern Inner Mongolia. Germany: German Jews are stripped of rights by Nuremberg Race Laws, which relegate Jews to a separate second-class status in Germany and prohibits intermarriage and sexual relations with Germans. Spain: Day 61 of 985 of the Spanish Civil War. Spain: Day 426 of 985 of the Spanish Civil War. CBI - China: Day 71 of 2,987 of the 2nd Sino-Japanese War. Day 34 of 106 of the 2nd Battle of Shanghai. Day 15 of 70 of the Battle of Taiyuan. 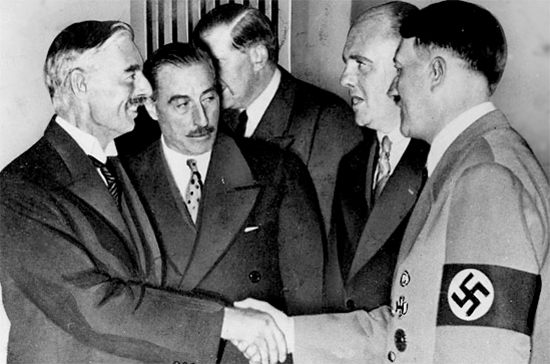 Germany: British Prime Minister Neville Chamberlain meets with Hitler at Berchtesgaden, Germany. Afterward he says that Hitler appears to be "a man who could be relied upon when he had given his word." The face to face meeting between Chamberlain and Hitler lasted about three hours. Hitler demanded the annexation of the Sudetenland, and through questioning him, Chamberlain rather naively felt assured that Hitler had no designs on the remainder of Czechoslovakia or on the areas in Eastern Europe which had German minorities. After the meeting, Chamberlain returned to London, believing that he had obtained breathing space during which an agreement could be reached and the peace preserved. Hitler, on the other hand, knew he had completely pulled the wool over Chamberlain's eyes. Spain: Day 791 of 985 of the Spanish Civil War. CBI - China: Day 436 of 2,987 of the 2nd Sino-Japanese War. Day 97 of 139 of the Battle of Wuhan. 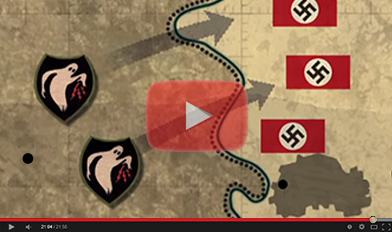 Poland: Day 15 of 36 of Germany's Invasion of Poland. Gdynia is captured by German forces. A Polish breakout attempt from the Kutno pocket fails. CBI - China: Day 801 of 2,987 of the 2nd Sino-Japanese War. Day 3 of 26 of the 1st Battle of Changsha. CBI - Mongolia: Day 128 of 129 of the Battle of Khalkhin Gol. The Soviets are close to victory. Atlantic: Southeast of Iceland, the Canadian merchant ship Kenordoc is sunk en route to Bristol, England. ETO - UK: Day 10 of 258 of the Blitz. London targeted again, as well as Southampton, Bristol, Cardiff, Liverpool and Manchester. ETO - UK: Day 68 of 114 of the Battle of Britain. East Africa: Day 98 of 537 of Italy's East African campaign in the lands south of Egypt. CBI - China: Day 1,167 of 2,987 of the 2nd Sino-Japanese War. Day 306 of 381 of the Battle of South Guangxi. Day 27 of 42 of the Hundred Regiments Offensive. ETO - France: German soldiers are attacked by locals at the Avenue des Champs Elysees in Paris. Russian Front - Finland: Day 86 of 164 of the Battle of Hanko. The Soviets will be forced off their leased naval base. Russian Front - Finland: Day 12 of 28 of Finland's reconquest of East Karelia in southern Finland. The Soviets continue withdrawing from Finland back to Leningrad. Russian Front - Finland: Day 79 of 142 of Operation SILVER FOX, a joint German-Finnish campaign to capture the Russian port of Murmansk in the Arctic. The German troops continue withdrawing back into northern Finland. Russian Front - Finland: Day 77 of 140 of Operation ARCTIC FOX, a joint German-Finnish campaign against Soviet Northern Front defenses at Salla, Finland. Russian Front: Day 86 of 167 of Germany's Operation BARBAROSSA, the overall invasion of the USSR. Russian Front - North: Day 8 of 872 of the Siege of Leningrad. Russian Front - South: Day 39 of 70 of the Siege of Odessa, Ukraine. Russian Front - South: Day 24 of 35 of the 1st Battle of Kiev, Ukraine. MTO - Libya: Day 159 of 256 of the Siege of Tobruk. Middle East: Day 22 of 24 of the Anglo-Soviet invasion of Iran. East Africa: Day 463 of 537 of Italy's East African campaign in the lands south of Egypt. CBI - China: Day 1,532 of 2,987 of the 2nd Sino-Japanese War. Day 10 of 33 of the 2nd Battle of Changsha. Russian Front - North: Day 373 of 872 of the Siege of Leningrad. Russian Front - North: Day 134 of 658 of the Siege of the Kholm Pocket, USSR lays siege to the Kholm Pocket but the Germans hold out for a about a year and a half. Russian Front - Center: Day 48 of 64 of the 1st Battle of Rzhev-Sychevka, Russia. Though it will end in a stalemate, it will keep German troops from going to Stalingrad. Russian Front - South: Day 80 of 150 of Germany's CASE BLUE, the failed offensive to take the Caucasus oil fields. Russian Front - South: Day 24 of 165 of the Battle of Stalingrad, the bloodiest battle in human history. Fierce fighting between German and Soviet forces erupts for possession of Mamayev Kurgan, the strategic hill overlooking Stalingrad. MTO - Egypt: US and RAF warplanes make raids on the German troops west of El Alamein. MTO - Greece: A lone US B-24 on a recon mission bombs a tanker at Suda Bay, Crete. East Africa: Day 134 of 186 of the Battle of Madagascar. CBI - China: Day 1,897 of 2,987 of the 2nd Sino-Japanese War. Day 124 of 124 of Japan's Zhejiang-Jiangxi Campaign, launched to punish anyone suspected of aiding the Doolittle raiders in China. Estimates are that some 250,000 Chinese have been killed. PTO - Alaska: Day 101 of 435 of the Battle of Kiska, Aleutian Islands. The US and Canada will defeat the Japanese invaders. PTO - Malaya: Day 209 of 357 of the Battle of Timor Island, a long guerrilla war ending in Japanese victory. PTO - New Guinea: Day 57 of 119 of the Battle of the Kokoda Track. The Australians continue pushing back the Japanese troops. This will become an Allied victory. PTO - Solomon Islands: Day 40 of 187 of the Battle of Guadalcanal. PTO - Solomon Islands: A Japanese submarine sinks the carrier USS WASP, the destroyer USS O'BRIEN, and damages the battleship USS NORTH CAROLINA. Germany: Three days following his rescue by German commandos, deposed Italian dictator Benito Mussolini is taken to Germany for a meeting with Adolf Hitler in Rastenburg at his East Prussian headquarters. It is the last of fourteen meetings between the two. Despite public professions of support, Hitler is clearly shocked by Mussolini's disheveled and haggard appearance as well as his unwillingness to go after the men in Rome who overthrew him. ETO: US 8th Air Force warplanes hit targets in France and the Netherlands. Russian Front - North: Day 738 of 872 of the Siege of Leningrad. Russian Front - North: Day 499 of 658 of the Siege of the Kholm Pocket, USSR lays siege to the Kholm Pocket but the Germans hold out for a about a year and a half. Russian Front - Center: Day 40 of 57 of the 2nd Battle of Smolensk, Russia. Becomes a Soviet victory as the Axis are pushed completely away from the Moscow region. Russian Front - Center: Day 30 of 48 of the Battle of Bryansk, Russia. German troops continue evacuating Bryansk, some 200 miles southwest of Moscow. Russian Front - South: Day 23 of 122 of the Battle of the Lower Dnieper River, USSR. MTO - Italy: The US 9th and 12th Air Forces provide the air cover for the US 5th Army and British 8th Army around Salerno. CBI - China: Day 2,262 of 2,987 of the 2nd Sino-Japanese War. PTO - New Guinea: Day 147 of 148 of the 2nd Battle of Lae-Salamaua. Australian 7th and 9th Divisions capture Lae after some very heavy fighting. Tomorrow this will officially become an Allied victory. PTO - Solomon Islands: Day 32 of 56 of the Battle of Vella Lavella. The Allies will win this one. Atlantic: RAF Lancaster bombers from Russia pound the German Battleship TIRPITZ (sister ship of the BISMARCK) with Tall Boy bombs in Kaa Fjord, Norway, scoring direct hits right throughout the ship. ETO - France: Day 46 of 284 of the Battle of Brittany. ETO - France: Day 32 of 32 of Operation DRAGOON, the Allied invasion of southern France. The southern push is complete as US 1st Army enters and occupies Nancy. ETO - Belgium: Day 14 of 62 of the liberation of Belgium. ETO - France: Day 1 of 236 of the Siege of Dunkirk. Russian Front - Finland: Day 1 of 223 of the Lapland War. Finland and Russia have joined forces to kick the Germans out of Finland's most northern province. Russian Front - North: Day 2 of 41 of the Battle of Riga, Latvia. The Soviets achieve a breakthrough at Narva, Estonia. Russian Front - Center: Day 2 of 72 of the Battle into East Prussia and northern Poland. Russian Front - South: Day 2 of 72 of the Battle of Belgrade, Yugoslavia. MTO - France: US 15th Air Force: B-24s fly a supply mission to southern France. MTO: US 15th Air Force: B-24s begin evacuating aircrews formerly imprisoned in Bulgaria from Cairo, Egypt to Bari, Italy. MTO - Greece: US 15th Air Force B-17s and B-24s bomb Tatoi, Eleusis, the Kalamaki Airfields, and Salamis submarine base. CBI - Burma: Day 168 of 302 of the Chinese Salween Offensive in Burma. CBI - China: Day 2,628 of 2,987 of the 2nd Sino-Japanese War. Day 152 of 259 of Japan's Operation ICHI-GO. PTO - Dutch East Indies: US Troops invade Morotai Island. Operation TRADEWIND. PTO - New Guinea: Day 276 of 597 of the Battle of New Britain. PTO - New Guinea: Day 147 of 481 of the Battle of Western New Guinea. PTO - Palau Islands: Day 1 of 74 of the Battle of Peleliu (Operation STALEMATE II). US 1st Marine Division lands on Peleliu Island, but suffers 1,100 casualties trying to establish a shallow beach-head. 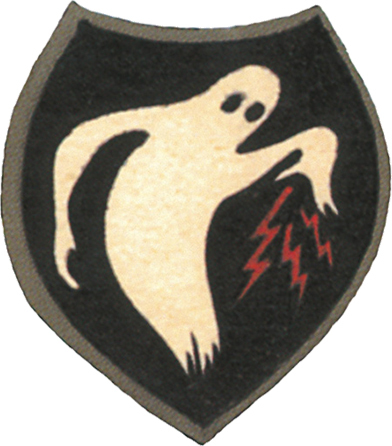 USA: The 23rd Headquarters Special Troops, now better known as the "Ghost Army" tactical deception unit, is deactivated. 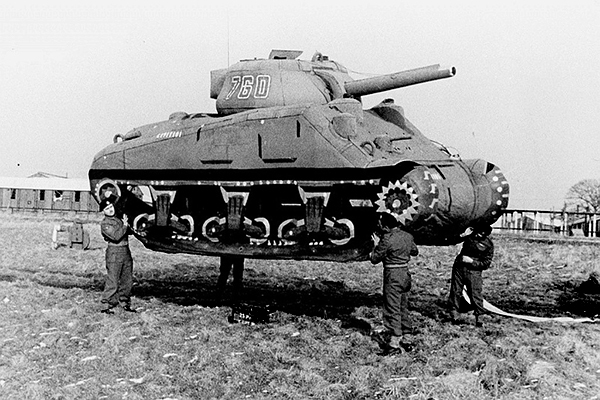 The Ghost Army was a US Army tactical deception unit during WWII officially known as the 23rd Headquarters Special Troops. The 1,100-man unit was given a unique mission within the Army to impersonate other US Army units to deceive the enemy. From a few weeks after D-Day, when they landed in France, until the end of the war, they put on a traveling road show, using inflatable tanks, sound trucks, phony radio transmissions and playacting. They staged more than 20 battlefield deceptions, often operating very close to the front lines. Their mission was kept secret until 1996, and elements of it still remain classified. Although the 23rd consisted of only 1,100 soldiers, the contingent used equipment pioneered by British forces such as dummy tanks and artillery, fake aircraft and giant speakers broadcasting the sounds of men and artillery to make the Germans think it was upwards of a two-division 30,000 man force. The unit's elaborate ruses helped deflect German units from the locations of larger allied combat units. The unauthorized insignia for the "Ghost Army"
We're not sure when this insignia came to be, but it was most likely never a patch worn by any of the men of the 23rd during the war. The visual deception arm of the Ghost Army was the 603rd Camouflage Engineers. It was equipped with inflatable tanks, cannons, jeeps, trucks, and airplanes that the men would inflate with air compressors, and then camouflage imperfectly so that enemy air reconnaissance could see them. They could create dummy airfields, troop bivouacs (complete with fake laundry hanging out on clotheslines), motor pools, artillery batteries, and tank formations in a few hours. The 3132 Signal Service Company Special handled sonic deception. Aided by engineers from Bell Labs, a team from the 3132 went to Fort Knox to record sounds of armored and infantry units onto a series of sound effects records that they brought to Europe. For each deception, sounds could be "mixed" to match the scenario they wanted the enemy to believe. This program was recorded on state-of-the-art wire recorders (the predecessor to the tape recorder), and then played back with powerful amplifiers and speakers mounted on halftracks. The sounds they played could be heard 15 miles away. "Spoof radio," as it was called, was handled by the Signal Company. Special Operators created phony traffic nets, impersonating the radio operators from real units. They were educated in the art of mimicking a departing operator's method of sending Morse Code so that the enemy would never detect that the real unit and its radio operator were long gone. To complement existing techniques, the unit often employed theatrical effects to supplement the other deceptions. Collectively called "atmosphere," these included simulating actual units deployed elsewhere by the application of their divisional insignia, painting appropriate unit insignia on vehicles and having the individual companies deployed as if they were regimental headquarters units. Trucks would be driven in looping convoys with just two troops in the seats near the rear, to simulate a truck full of infantry under the canvas cover. Military Police would be deployed at cross roads wearing appropriate divisional insignia and some officers would simulate divisional generals and staff officers visiting towns where enemy agents were likely to see them. A few actual tanks and artillery pieces were occasionally assigned to the unit to make the "dummies" in the distance appear more realistic. ETO: The fifth anniversary of the Battle of Britain, 300 RAF aircraft fly over London. A single leader in the right place at the right time and with the right qualities can change the course of history. The ghosts of the European theater in World War II were members of the 23rd Headquarters Special Troops who worked to deceive the Germans on the battlefield.